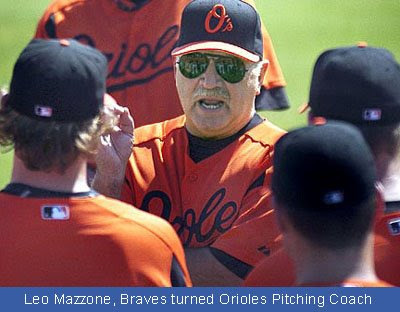 Leo Mazzone tells the AJC's Terence Moore that he "messed up" by leaving the Braves after the 2005 season. It makes you wonder why we always think the grass is greener on the other side. I mean, Leo had it flat-out made in Atlanta. He answered to no one but Bobby Cox, and Cox was smart enough to leave him alone to do his thing. Why mess with a good thing? You know, it was 'the car's running fine, leave the hood down' kinda thing. He had a system that worked. His Braves' pitchers produced big-time under his tutelage; and they struggled when they were no longer in Atlanta working with him. He could have been with the Braves organization forever, but he chose to leave. You know, that 'green grass' syndrome we talked about kicked in. Now he's out of baseball altogether, except for some analyzing in the booth or from the studio. But without any of that 'green grass' under his feet.